Located in the UAE, in the city of Abu Dhabi, Corniche Beach stretches out for just over two kilometers, and is always pristine and spotless, helping it to earn its Blue Flag status. With up to 50,000 visitors heading to Corniche Beach each month, the sands may sometimes be crowded, but the atmosphere is always vibrant, lively and full of energy. 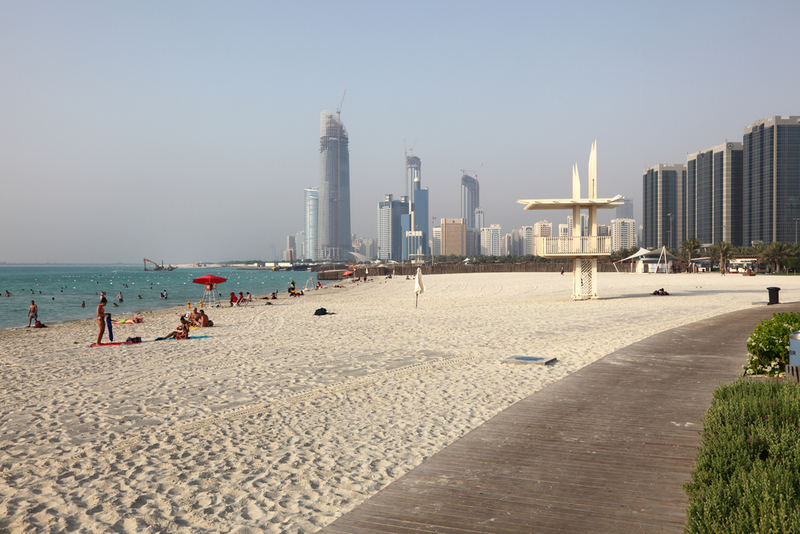 The main section of Corniche Beach is the family beach, which, in accordance with local culture, single men are not permitted to enter. Lined with palm trees and lush, landscaped gardens, Corniche Beach is a natural oasis in the heart of a built up city, making it a great destination for a family day out. In order for families to enjoy the utmost privacy, the beach is fenced off and shielded from public view. The children’s playground here is always a big hit, and there are beach umbrellas available to rent, so that you can keep them shaded from the sun. It is possible to swim at this beach, even with young children, and there are floating fences not too far out, to prevent anyone from drifting too far into the water. Several beach volleyball courts are available for those who want to stay active, and, when it comes time for a bite to eat, there are a number of cafés and ice cream shops just nearby. Al Sahil is a paid section of Corniche Beach that welcomes all visitors, and has no restrictions. Since the majority of families tend to stay in the family section of the beach, Al Sahil is popular with bachelors, singles and larger groups of people. Blue Flag is a world-renowned eco-label that has been granted to over 4000 beaches, in 49 different countries, around the world. Corniche Beach obtained its Blue Flag status in 2011, meaning that it meets high standards when it comes to water quality, services and amenities, environment management and education. Due to the intense heat of the sun in Abu Dhabi, ice cream shops and juice bars are always popular, and there are a number to be found along Corniche Beach, such as Special Juice Bar, Baskin Robbins and Cold Stone Creamery. For those that want more of a meal, Rosina Bellina is a stunning Italian restaurant overlooking the beach, while Nova Café serves up a range of tasty light bites. Being an extremely built up city, Corniche Beach is a breath of fresh air in Abu Dhabi, providing both tourists and locals with a place from which they can truly appreciate the beauty of nature. With over 600 sun loungers and 30 cabanas dotted around the beach, there are plenty of areas at which you can spend the entire day, as well as several activities and facilities to keep you busy and entertained. The beach is open daily from 7:30 in the morning until midnight, and is well-lit during the darker hours of the day. While the family beach and Al Sahil do charge a small admission fee, the other parts of Corniche Beach are free for use by the public.